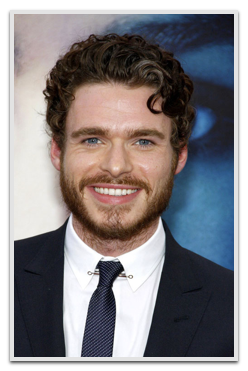 At the age of 11, Richard Madden joined Paisley Arts Centre’s youth theatre programme to help overcome his shyness. He was soon cast as young Andy in the film adaptation of Iain Banks’s Complicity, followed by him being cast in a lead role as Sebastian in the television series Barmy Aunt Boomerang, for which he filmed six episodes that aired from 1999 until 2000. He graduated from the Royal Scottish Academy of Music and Drama in 2007. While at RSAMD he worked with the Arches and Glasgow Repertory Company, followed by Franz Xavier Kroetz’s play Tom Fool at the Citizens’ Theatre, which was so well received that it transferred to London, where Madden was spotted by a team from the Globe Theatre. In his final year with RSAMD, he was cast as Romeo in a production of Romeo and Juliet at the Globe Theatre which, after a run in London, toured in open-air stages during the summer of 2007, being the Globe’s first-ever tour. He also played Callum McGregor in the stage production of Malorie Blackman’s Noughts and Crosses in 2008. He later gained the lead role of Dean McKenzie in the 2009 BBC series Hope Springs, followed by his roles as Ripley in the 2010 film Chatroom, and as Theatre of Hate singer Kirk Brandon in the 2010 film Worried About The Boy. From 2011 to 2013, he starred as Robb Stark in the HBO series Game of Thrones, based upon George R. R. Martin’s A Song of Ice and Fire series of novels, the Channel 4 series Sirens, and in the BBC series Birdsong. Madden can next be seen as the prince in the live action Disney film Cinderella.